Think of Berlin and vivid pictures of the World War era start forming in your mind. Berlin was the centre of power. As history has it, the city was in shambles when it was repeatedly bombed by the allies. That's behind us now. Boom of the bomb was then. It's boom of the economy now. It's amazing to see the progress of the city today. I was in Berlin to attend a trade fair. Germany is very active in organizing fairs. Messe Berlin is one amongst many cities in Germany - notably Frankfurt and Düsseldorf. The exhibition halls will easily swallow tens & tens of football fields. Unless a visitor exactly knows what he is looking for, he is likely to get lost. I had kept one last day to find out as much as I could about the city. In the fair area stands the Funkturm Berlin. It is a 150 meter tall lattice radio tower built between 1924 and 1926. The tower reminded me of Eiffel Tower. 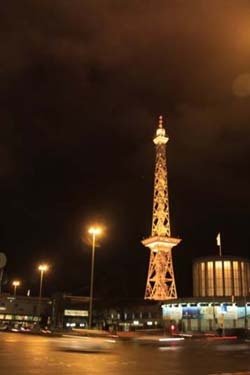 At 55 meters the tower has a restaurant and an observation deck accessible by a windowed elevator. Depending upon the duration of your stay, buying a transit pass makes lot of sense. I spent just Euro 6.5 that allowed me unlimited travel on buses, underground and trams for 24 hours. Journey to Berlin's Tegel airport included. Berlin has excellent public transport system - clean, fast & efficient. I stayed at ApartCity Hotel on Kaiserdamm within walking distance from Messe Berlin. I validated my transit card at Theodor Heuss Platz station on U2 line at 10:43. I had nothing to worry till 10:42 the next day. I commenced my city tour from the West end and cut all the way across to the East side with little zig-zagging in between. The first stop was Olympic Stadium. When the Nazis came to power in Germany in 1933, they decided to use the Olympic Games for propaganda purposes. With these plans in mind, Hitler ordered the construction of a great sports complex in Grunewald named the Reichssportfeld with a totally new Olympiastadion. The construction took place from 1934 to 1936. 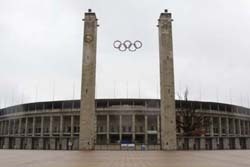 When the stadium was completed, it was 326 acres and consisted of the Olympiastadion, the Mayfield, the Waldbuhne amphitheater and various buildings and facilities for different sports. On August 1, 1936, the Olympics were officially inaugurated by the Nazi Dictator, Adolf Hitler, and the Olympic Flame was lit by the athlete Fritz Schilgen. Four million tickets were sold for all the events of the 1936 Summer Olympics. Among the sport competitions, one of the most memorable events was the performance of the African-American track and field athlete Jesse Owens, representing the United States of America. Owens was awarded the gold medal in 4 categories: 100 metres, 200 metres, long jump and 4 x 100 metres relay. 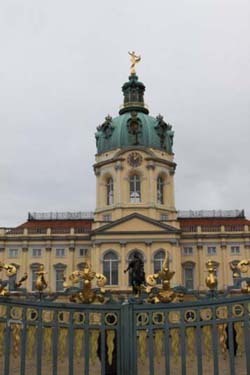 Next, I alighted at Sophie-Charlotte Platz station and walked about 15 minutes to reach The Schloss Charlottenburg. Charlottenburg Palace is the largest palace in Berlin and the only building in the city dating back to the time of the Hohenzollern family. 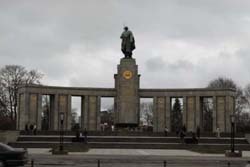 It is located in the Charlottenburg district of the Charlottenburg-Wilmersdorf area. The palace was built at the end of the 17th century and was greatly expanded during the 18th century. It includes much exotic internal decoration in baroque and rococo styles. A large formal garden surrounded by woodland was constructed behind the palace. In the grounds of the palace various buildings were erected, including a belvedere, a mausoleum, a theatre and a pavilion. During the Second World War the palace was badly damaged but has since been reconstructed. Thereafter I took the M45 bus that got me to Zoologischer Garten terminal, just opposite to The Kaiser William Memorial Church. The original church on the site was built in the 1890s. It was badly damaged in a bombing raid in 1943. The present building, which consists of a church with an attached foyer and a separate belfry with an attached chapel, was built between 1959 and 1963. The damaged spire of the old church has been retained and its ground floor has been made into a memorial hall. The new buildings are constructed of concrete, steel and glass. 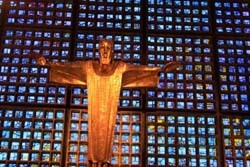 The walls of the church are made of a concrete honeycomb containing 21,292 stained glass inlays. The predominant colour is blue, with small areas of ruby red, emerald green and yellow. A must see. Bus No 100 took me to The Victory Column - a famous monument in Berlin. 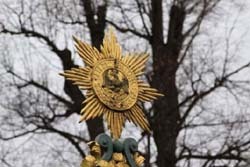 Designed by Heinrich Strack after 1864 to commemorate the Prussian victory in the Danish-Prussian War, by the time it was inaugurated on 2 September 1873, Prussia had also defeated Austria in the Austro-Prussian War (1866) and France in the Franco-Prussian War (1870-71), giving the statue a new purpose. 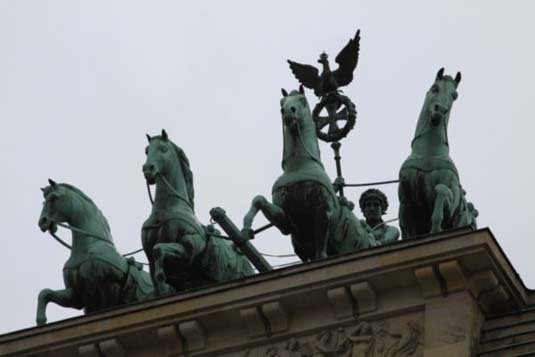 Different from the original plans, these later victories in the so-called unification wars inspired the addition of the bronze sculpture of Victoria, 8.3 meters high and weighing 35 tonnes, designed by Friedrich Drake. While there's a bus or a cycle rickshaw that can take you to the Berlin Gate, I strongly suggest you walk the route. At least 2 kms. long and straight, Strasse Des 17 Juni, would certainly rank amongst the good roads that I have walked around the world. Wide street, cycle way, walk way and the dense forest on both sides of the road, punctuated by water bodies and meadows is captivating. Fortunately, the 4 degree Celsius temperature came in handy. In summers, be prepared to perspire. The Brandenburg Gate also popularly called the Berlin Gate is an iconic landmark of Berlin and Germany. It appears on German Euro coins (10 cent, 20 cent, and 50 cent). Unter den Linden is a tree lined East-West Avenue from the Brandenburg Gate to the site of the former Berliner Stadtschloss. 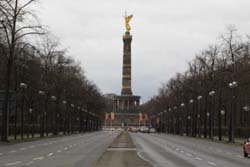 The avenue was once Berlin's premier promenade. It's a major tourist attraction today. Adjacent to the Berlin Gate is the Reichstag building which is the traditional seat of the German Parliament, renovated in the 1950s after severe World War II damage. The building was again remodeled by British architect Norman Foster in the 1990s and features a glass dome over the session area, which allows free public access to the parliamentary proceedings and magnificent views of the city. Being Sunday, there were no proceedings. If you happen to be there on a working day, do make it a point. A trip to Berlin, or for that matter Germany, is not truly complete until you have had currywurst (a German delicacy made up of sausages accompanied with French fries and curried onions) & beer. 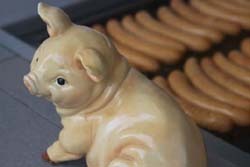 Generally speaking, Germany offers great choice to the carnivores. Of course, vegetarians can survive too. With stuff in, I gathered the energy to walk for about 30 minutes to a small leftover portion of the Berlin Wall and further down to Check Point Charlie. Checkpoint Charlie was the name given by the Western Allies to a crossing point between East Berlin and West Berlin during the Cold War. It is in the Friedrichstadt neighborhood, which was divided by the Berlin Wall. Many other sector crossing points existed in Berlin. Some of these were designated for residents of West Berlin and West German citizens. Checkpoint Charlie was designated as the single crossing point (by foot or by car) for foreigners and members of the Allied forces. During its 28-year active life, the infrastructure on the Eastern side was expanded to include not only the wall, watchtower and zigzag barriers, but a multi-lane shed where cars and their occupants were checked. However the Allied authority never erected any permanent buildings, and made do with the iconic wooden shed. Back on the train to head to Alexanderplatz, which indeed is the most prominent junction in Berlin. In close proximity are the Town Hall, TV Tower, Berlin Dom, churches and excellent shopping arcades. The TV tower at Alexanderplatz is the second tallest structure in the European Union at 368 meters. Built in 1969, it is visible throughout most of the central districts of Berlin. The city can be viewed from its 204 meter high observation floor. I could not visit the top for want of time. It was already 8 PM. 9 hours on foot. The U2 got me straight to the hotel. I was to check out early next morning. Now to make you aware of my stupidity. While coming from the airport I took help of Google maps. Technically I was given the correct way to reach my hotel from Tegel airport. The suggestion called for a bus (X9) journey and 2 train changes (Jakob - Kaiser - Platz & Bismarckstrasse & finally to Theodor Heuss Platz). To avoid the train change I took the U2 to Zoologischer Garten and changed to bus 109 for the airport. To my amazement the bus went past Kaiserdamm. It had a stop just a couple of 100 meters from my hotel. Had I known, the little extra walk would have saved me at least 30 minutes and the hassle of lugging the bags. Not all stations in Berlin underground have lifts or escalators. Moral: Do trust Google maps but double check with the locals. There might be a better alternative that defies computer logic. No harm done. I was in time for my flight back home.